Reading Shri Sai SatCharitra or going through Sai SatCharitra parayana is one of the most loved activity of mine. 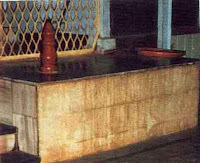 It all started with my first experience with this sacred book, which is mentioned in my first experiences with Shirdi Sai Baba. It was an experience amazing, while i was not reading this sacred book. Would like to quickly share it here again. It was real tough time on my consciousness. My heart and complete self was in real pain (not physical). Was spending the days lying on the bed, with often burst of silent tears rolling out of eyes. There was nothing else to do but to go through this pain with inner chanting of the name Sai Baba. 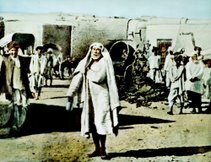 The pain was accepted as a part of karmic happening and so there was no complain towards anything or anyone, according to the teachings of Baba Sai. Only things that i got of my bed were, to complete the needed gross rituals like brushing teeth, answering nature's calls, taking bath etc. Little food was taken to sustain the physical body as a help to go through this pain. Then, at a point the pain in the heart got real wild. The painful energies started rushing madly starting from the heart towards the brain and it felt this will make this person insane. Somehow with a miracle of Sai Baba. My hand moved itself and grabbed the copy of Shri Sai SatCharitra that i used to read often. The sacred book placed itself on the left hand side of the chest. There was a rush of Baba's grace or Baba's love from the sacred book towards the heart. The pain was still there. 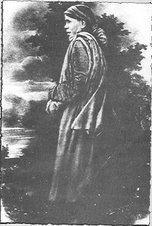 But a far more powerful force called Baba's grace was holding and supporting the heart. The maddening rush of energies in the head, condensed at a single point on the third eye. The fear of getting mad was over. The pain was there, but the support was far greater, and slowly and gradually in few days the pain had to leave. 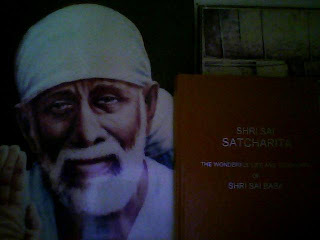 I was reading this sacred book few moments ago, like to share a story of Sai Baba from it as i saw it. So started writing. 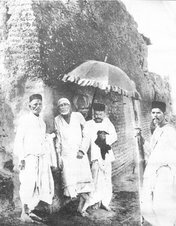 At this point it seems Baba wants the above and the more recent experience with this sacred book of Shri Sai to appear on this blog. So shall do this. 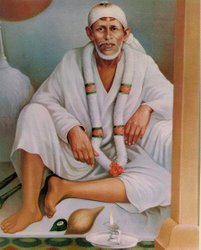 I was reading a wonderful book on Shri Shirdi Sai Baba named 'Sai Baba the Master', by Pujya Acharya Sri Ekkirala Bharadwaja, you can read Sai Baba the master online. This book is also on my list of good books on Sai Baba. While reading it i came to an incident where Guru Sai Baba asked a devotee to do 108 parayans Guru Charitra. This evoked my love for Sai SatCharitra. As reading it is always an experience to being very close to Baba. The grace constantly flows through my hands holding the sacred book and filling my body from within. I started doing it and was able to finish 108 Sai SatCharitra parayans. On request, a devoted singer and a good friend of mine Vikram Hazra visited my home and sung Bhajans for Baba, as a part of spiritual ceremony of the completion of these 108 Sai SatCharitra parayans. Below you can see a video snippet recorded on normal digital camera. This sacred book i prefer to keep near me always. Often in my hands, as i feel the flow of Baba's grace. 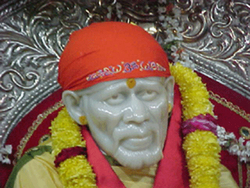 I keep it beside the pillow and keep one hand on it and go to sleep with mental chanting of Sai Baba's name. One night in deep sleep i had a dream. Somebody pulled me gently and showing me a well, told me, "Something very valuable has fallen in the well. Pull it out quickly." So with the help of pulley and a rope i pulled up that valuable thing out of the well. I leaned forward and grabbed it. It was a kind of box in a gift wrapping. I removed the wrapping and moved the wrapping and tried to feel the content with both the palms of my hands. It was a small plastic cuboid, with small door. 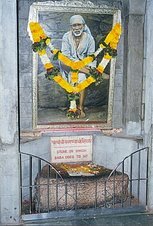 I opened those small doors and saw Baba's picture, sound of chanting of name "Sai Baba" along with soft music was clearly herd. "Oh, This is Baba." i said to myself. Then in a split of second the dream or the vision was over. 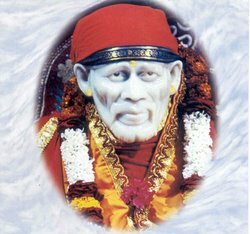 Since it was real deep sleep even in the vision it took a while and much efforts to open my eye lids to have a look at Sai's picture again, while my hands and fingers tried to open the plastic doors of that slim cuboid to have another look at Baba. It took a while an some struggle to open up that plastic cuboid. As it was opened, the struggle to open the eye lids also ended. "Hey, where is Baba!" i said to myself. I had a closer look and could see marking which i did with the pen for each completions of Sai SatCharitra Parayan, on the first inner page of this sacred book. It was a marked record that i kept. "Oh, this is Sai SatCharitra. ", i said to myself. Then i realized that, it had fallen down from bed on the other side. I put back the sacred book where i generally put it while i sleep, besides my pillow. Placed my hand on it, in less then a second i was in sound deep sleep again. In the morning i remembered everything and wondered how the book travelled all the way from one side of pillow to the other side. I still wonder about it! But most important thing is, with the incident Baba showed me of how valuable this book is for me, and also for other devotees who love Him. It is not just a book. Baba's grace flows through it! 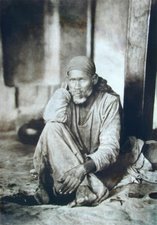 Om Sai Om Sai Om Sai.